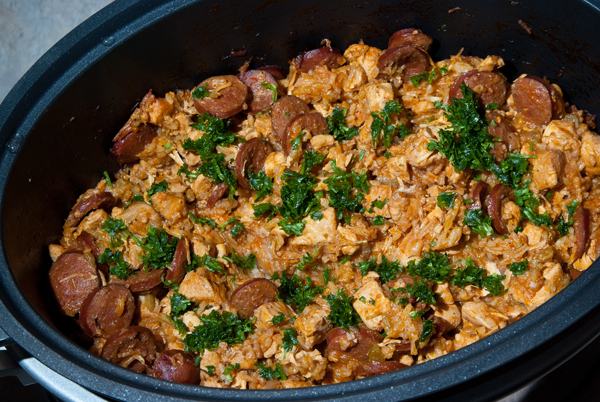 Duc and I had agreed to make jambalaya the first dish we'd make in the slow cooker we had recently purchased. So we got all the ingredients and had a fun time making delicious food. Though cooking in a slow cooker where you can just throw everything together, you have to first prep the ingredients! Lots of dicing, chopping, crushing, and cubing. I decided to separate my ingredients by what all had to be together. 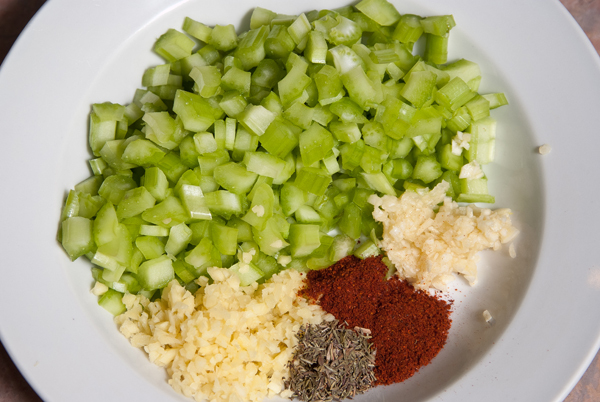 The celery, chili powder, garlic, ginger, and thyme will go in altogether at one point so you can set that altogether aside. You can prep all the ingredients and let the chicken stock come to a boil in a saucepan. For the chicken, flavor with salt and pepper during the prep. 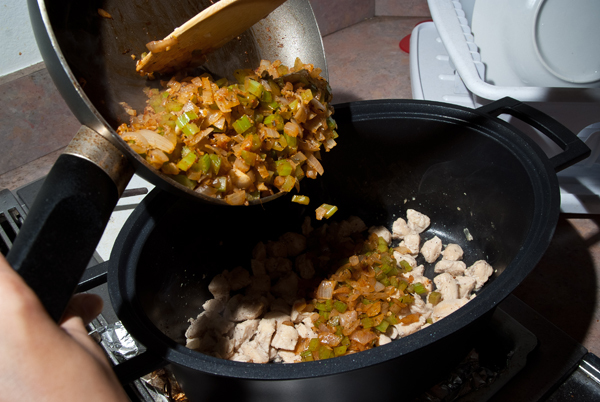 In a large skillet (or if you have a slow cooker like mine, in the crockpot), start cooking the chicken with olive oil. It is done once it has become a slightly golden brown. In a separate skillet, cook the onion until nearly translucent. Then add the celery, chili powder, garlic, ginger, and thyme to the onions. Mix for 2-3 minutes before adding to the chicken pot. 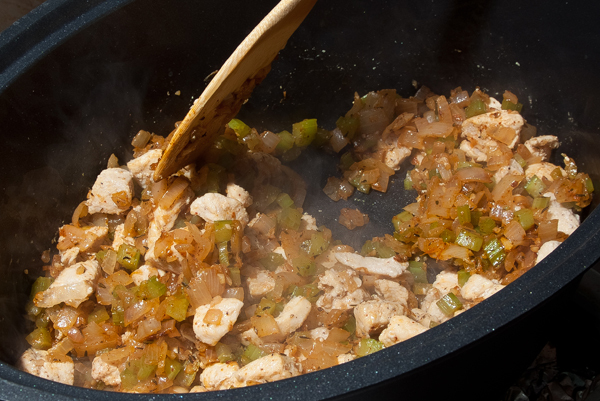 Place all the ingredients in your crockpot if they aren't already. Mix tomato sauce into your boiling chicken broth & add the two dashes of Tabasco sauce; put liquid mixture into crockpot and cook on high for 1 1/2 hours. After such time, add in the 1.5 cups of white rice and cook for 35-45 minutes (don't let rice get mushy). Check the rice near the end to see that most of the stock has been absorbed; if it's too dry, add more stock. 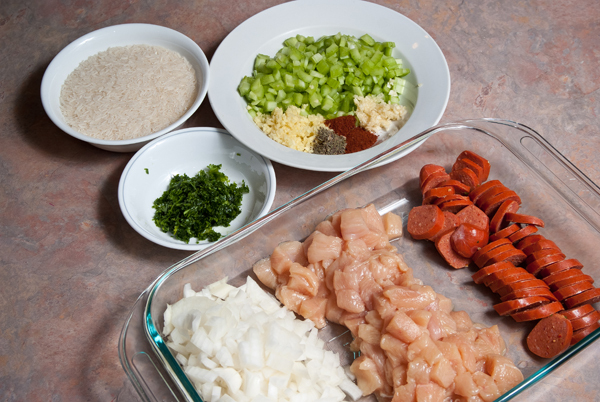 Check the rice and if it is done, add in the sliced sausage and fluff the mix with a fork. Cook for another 15 minutes before adding in the chopped parsley and fluffing again. Enjoy your delicious dinner! 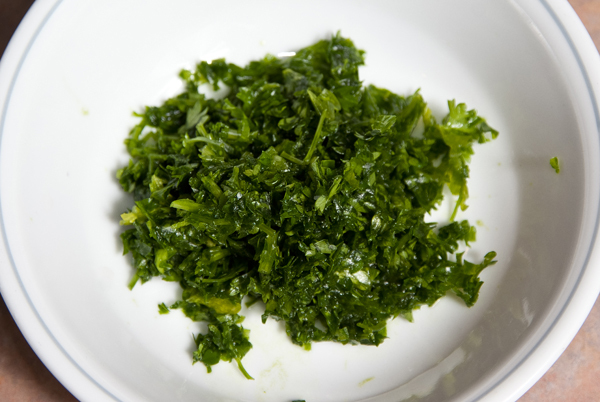 You may also garnish with some more chopped parsley if liked. mmm delicious! I want to try this! Have you tried finding andouille sausage? I wonder if it's similar to this hot-link sausage. I don't know if you can find it outside of LA though!